I don't even remember this. I wonder how long the collection will continue. And what on earth is 200mm? (I know, but I can't visualise it). Either my math is way off, or they mean cm. Damn, I hate metric measurements. What is wrong with miles, pints, pounds and ounces? Can't we all use them? Here's to imperial measurements. Always. Yes, I found a ruler - they do mean cm. You don't remember ST III-VI, Robbie? I wish it were 200cm. As at 2m that would make it much closer match in scale to the little Enterprise models. Of course it would multiply the price substantially too! remember the ball at the base. Come on folks - 200 mm is just under 8 inches. It's fairly tall (it has to be somewhat affordable, after all). As a Physics and Math teacher, I am appalled by the lack of knowledge of SI units in this forum. They used 200mm in order to have lots of zeros in the length. 200mm is 20 cm. They should have used 祄 instead to make it more impressive. "This model is approx. 200000 祄 long!" I rarely drink alcohol because of my job, but when I do, I ask for a pint of Foster's lager or Guinness. I'd be surprised if a Brit went into a bar and said, "Can I have so many millilitres of ale, please?" If someone asks for directions/distance (walking), I'll pop out of my window and say something like, "It's 3 miles south of here." When I worked in the civil service, one task involved mailroom duties. I would mention the weight of a sack or parcel in "pounds and ounces". More power to those who want to use metric, but I grew up with imperial. And metric is too abstract to me. "What is wrong with miles, pints, pounds and ounces?" They are extremely difficult to convert into other units when needed for calculations. Eg., how many feet are in a mile? But metric makes unit conversions easy. How many feet are in a mile? And, no, I didn抰 have to look that up. There is no argument that the metric system, based on consistent multiples of 10, is superior to the imperial method梑ut whether one is more 揹ifficult� than the other is all a matter of familiarity. In NEW VISIONS I used metric. In real life, imperial. Countries that still use the Imperial System: Burma/Myanmar, Liberia, and the USA. Countries that use Metric: everybody else. And even within the USA, some high tech industries such as NASA do their work in Metric. If you can remember feet in a mile, tablespoons in a cup, square inches in an acre, etc., more power to you. But the Metric System is an order of magnitude easier to teach to children, and for adults to remember. 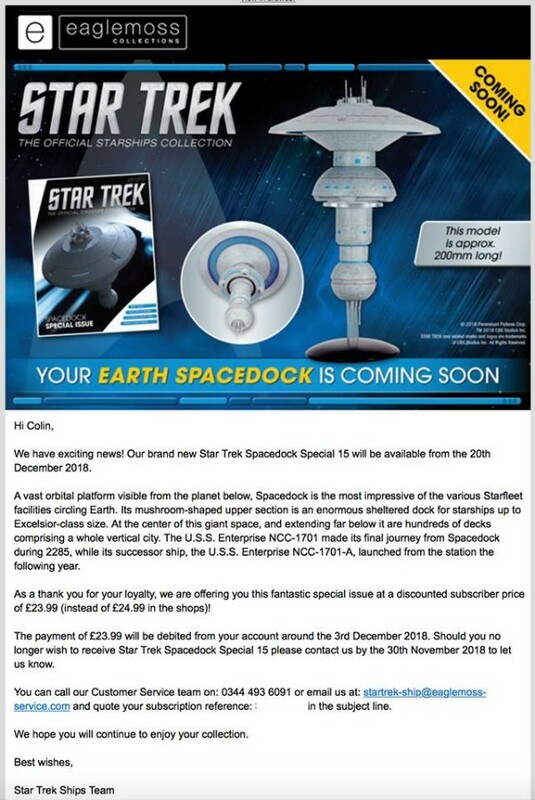 I am looking forward to my 200 mm Space Dock. Hopefully a similar sized Orbiting Office Complex will come along soon as well. Peter, my friend, the UK still uses the imperial system. Sort of. Greengrocers show both imperial and metric measurements. People who visit pubs will ask for a "pint of ale". And I can still request a pint of milk (or two) a week from the milkman. Okay, some services have a dual system (like THIS), but I don't think we've given up entirely. And we use miles on our road signs! "Peter, my friend, the UK still uses the imperial system. Sort of." Yes, of course. And in Canada there are still many ways we use Imperial in an informal way. People still talk about farmland in acres, not hectares. When ordering a steak, the menu will list its size in ounces. Surprisingly, no one talks about their weight in KG, even though it would be a much lower number than pounds! You like wrestling, right? It does sound impressive to hear a commentator say, "Look, he's lifted up a 500-pound guy and slammed him on the mat. What a night for the WWF!" (Okay, go on, ignore me, I'm rambling now). JB - I just saw that episode Monday! Given that the TOS Enterprise is 289 metres long, Starfleet sure didn't set the scale much bigger. Typical human arrogance! American customers could be easily accommodated! We are very schizophrenic in the UK when it comes to measurement (but it appears we are so in a lot of things). I used to work in the water industry and we used metric - beautiful system. 1 cubic metre of water was 1000 litres and weighed 1000 kg, which equalled 1 tonne. just beautiful. Everything aligns based on length, weight, even temperature because it all comes back to water - the stuff of life. However, very old trade effluent consents were in gallons, so I got VERY GOOD at converting gallons to cubic metres. but then, I was one of the last school cohorts that were taught both metric and imperial. Regarding temperature, some of our more, shall we say, dogmatic, papers, refuse to show temperature in Celsius and will only quote Fahrenheit. I do wonder what they will do once that generation has died off and they are left with a potential readership that does not have a clue what they are talking about. On a different note, That dry dock looks beautiful too. And I must have it! At least you weren't dealing with "stone" and "hundredweight" measurements! I do at least know what a cubit is! Ron, I still quote my weight in stones. I can抰 figure my weight in kg. I抦 a walking contradiction with units.